. . .ready for a little dinner after another full day of fun! Is it my imagination or do we all look a little tired? A little food and perhaps a Culver's custard will certainly revive us! 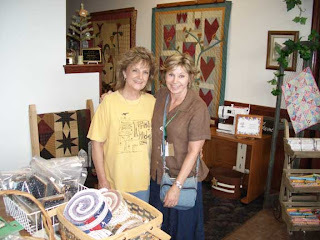 Lovely Shopkeeper Ms. Rita & Me - Quilter's Station is such a great SHOP! 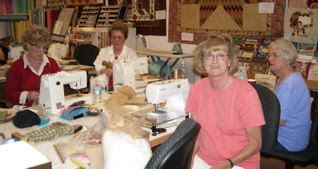 Don't miss visiting this shop if you are in the Kansas City area! Off to pack so I will be ready to catch my plane back to AZ as soon as class is over tomorrow. It will be sad to say good- bye to all my new & old friends here in MO. This is Clara's class! What a fun day . . . these are some of the most delightful girls you could ever spend a day with. 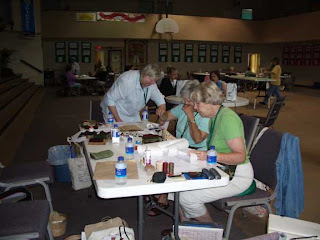 We stitched and laughed and had a wonderful time . 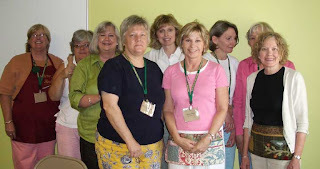 . . (from the left Denise, Laura, Nancy J, Marie, Susan, Me, Ellen, Lori & Nancy C). That was the morning of fun then I met my darling friend, Jo Morton, (yes THE Jo Morton) for a little antiquing fun in Greenwood, MO. (yes, yes Nancy from Thousand Oaks, CA I know "darling" is a bit overused in my vocabulary tsk tsk but they/you are ALL DARLINGS!) Then it was dinner with Sue Spargo, Cherie Ralston and Pat Sloan - (yes, yes THE Sue Spargo, THE Cherie Ralston and THE Pat Sloan) - DARLING girls! okay okay I can't help it they are DARLING! 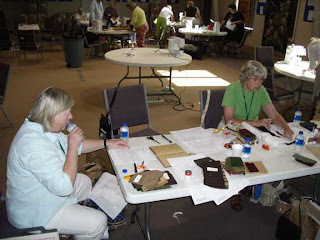 Then there was stitching and visiting in the lobby of the Hampton Inn. Can you think of a better time? Sweet dreams . . . night night!
. . . and yes dear I know we are going to be downsizing so I passed up all the primitive treasures EXCEPT the ones that were almost FREE! Too bad I don't know how to take a photo through glass but maybe you can still get the idea of how the windows look. 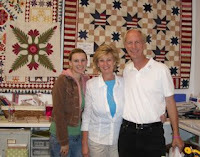 Stacy, Marilyn & Jerry - Cotton and Chocolate Quilt Shop is a family affair! 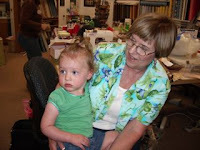 Precious Camryn and her adoring grandmother, Mary! 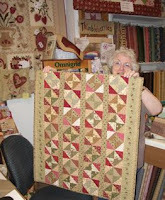 Margie and her wonderful Strippy Quilt from last year! These darling ladies brought lots of their wonderful projects from last year to share. I LOVE THAT! Thank you girls! There will be a new Cotton & Chocolate photo album with all their projects here on the side bar very soon. Somehow I can't seem to get the link correct - !!??!?!! 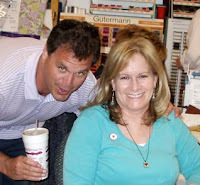 Sally's darling husband, Dan stopped by for a quick visit with us after golfing! What a cutie and such a nice fellow too! I spent this morning setting up a window display at Zoe's Trunk quilt shop in Chandler, AZ. The photos weren't very good because of the glass reflection - I will work on the glare and hopefully post those tomorrow! Here we are at the end of the first workshop . . . these Sweet Emma dolls still need their clothes but they are close to being finished. We ate and stitched and laughed and played all day long - we had a purely delightful day together! What more could a girl ask for? Most of us went for a delicious early dinner at Cisco's . . . . right across the parking lot - mmmmm Mexican cuisine! These girls really know how to have fun! Sally, Debbi and Mary - darling ladies! Sweet Emma with her kits and that cute little box filled with tiny spools of thread was a gift from sweet Debbi - WHAT a LUCKY Girl I AM! Thank you Ms. Debbi! 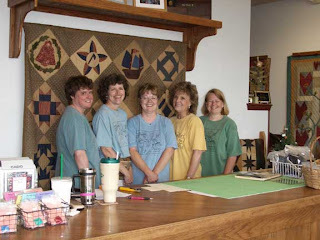 Cindy, Fran, Cheri and Margie - adorable ladies! Sleep is calling - better get some rest for another fun day tomorrow filled with laughter. 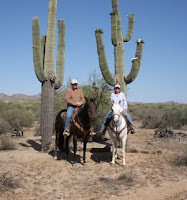 Here we are on the trail ride - that is me in the middle with Bob, my husband and our friend, Joan, on the dapple gray horse. I would call Joan's horse a white horse with cute little freckles but that is not what these real cowpokes said. I rode Bill and Bob rode his other horse, Mudslide. Pretty cute horses and very well mannered! Bill didn't seem to know or care that his rider didn't remember much about steering. We went Sunday morning for about two hours a little east of where we live. If we could have turned down the temperature a little bit it would have been a perfect morning ride - next time we will go closer to sun up. This is Steve with Joan . . . we are already planning the next trail ride - I think Bob is pretty excited that I am joining some of this horsing around. 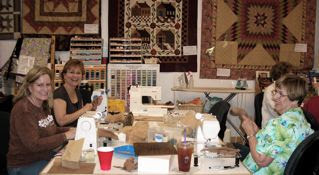 I am getting ready to travel to Cotton & Chocolate this weekend for two workshops. This shop is in Thousand Oaks, CA . . . a very nice shop with lots of REALLY darling ladies. Stop to visit this great shop if you are in the Southern CA area!